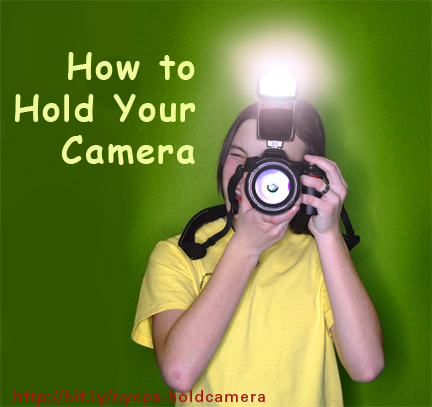 Is there a proper way to hold your camera? Yes, especially if you have a DSLR. The proper way to hold your camera is to grip it with your pinky, ring and middle fingers of your right hand. Then place your first finger on the shutter release while your thumb is gripping the back of the camera. With your left hand palm up, place your camera on the bottom of the palm of your left hand and grip your lens with your thumb and your middle finger or index finger of your left hand. If you curl your fingers down and then place your thumb and middle finger or first finger on the lens, you will have free access to your zoom and focus rings. When you are ready to take a vertical picture, leave your left hand where it is and bring your right hand up. By keeping your left hand in this position, you create a strong, steady base for your camera and you never block your popup flash. Join us for a photo tour and we’ll show you how to get more out of your photography.